Great Closets of New England provides custom storage solutions for every room in your home. We specialize in Bedroom, Kitchen, Pantries, Entry hall, Laundry rooms, Basements and Garage storage. Our interior closets are constructed using an all wood, made in America, component wood closet material. The material is manufactured for us in Duluth, Minn. and is backed by a manufactures lifetime warranty. And because it is an all wood product , we customized each designed space on site and we create a seamless, sophisticated closet with the look and feel of custom wood cabinetry, but for a fraction of the cost. For your garage and basement needs we feature Gladiator garagework by Whirlpool Corp. The strength of Gladiator products can be found in the authentic materials used, from thick heavy-duty steel to durable maple and bamboo for workbench tops. We start with a free estimate and in-home consultation to find out your storage wants and needs and then create a customize design. We provide a detailed CAD design of your project which has our recommendations and design ideas. Great Closets also offers you an exclusive program where we do it all- we design your space, remove and haul away your old material, repair all wall damage, paint your space using Benjamin Moore paints, remove any unwanted popcorn ceilings, replace/add baseboard or door molding, upgrade your lighting and we provide roll-away coat/clothes racks while we paint and install. Ordinato is a home organization + styling service created to help you simplify your life and love your home. I love the creative challenge of creating order out of chaos to make aesthetically pleasing spaces. 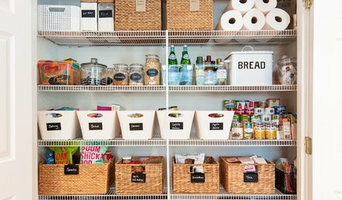 Organizing doesn’t have to mean moving clutter into ugly plastic bins! The systems we create help you stay organized for the long haul and give you back time and freedom to do the things you really want to do in your life. I'm a closet designer who has been in the closet business covering a variety of roles including Designer, Service Manager, Engineer and now I'm happily back to being a Designer-- this time around, for Innovative Closet Designs. At Innovative Closet Designs, Inc., we take the time to develop storage and bath solutions best suited to your needs. Home building and renovation can be a daunting task, but we are here to work with you to deliver quality, custom products that will improve the value of your home and make day to day life easier. With a wide range of product offerings and expertise, our goal is to be your “go to” company that you can entrust to refine and finish integral areas of your home. ICD offers custom laminate storage, wire shelving, and accessories to handle the most efficient to the most extravagant design for any space in the home. Allow us to work with you to show how space can be more organized and used most efficiently in your closet, pantry, home office, garage, mud room, laundry, etc. Unlike other closet and storage companies in the area, we’ve expanded to offer the finest solutions for your bathroom needs. Innovative Closet Designs is partnered with the finest accessory and medicine chest manufacturers in the industry to offer you a safe, stylish bathroom. We also provide and install bath enclosures from cost effective framed units to fully custom frameless enclosures, along with any custom cut mirror or glass products. For the past 30 years, we have been working at the largest builder sites and finest homes in New Jersey, New York, and Connecticut. Please contact us for a consultation with one of our local designers, or stop in at our showroom in Wyckoff, New Jersey. We look forward to helping you make your residence feel more like home. 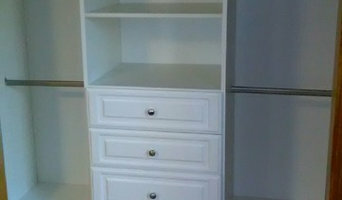 Closet Factory is the leader in our industry specializing in custom storage solutions for the entire home. For over 30 years, we have been creating dynamic, truly custom solutions for every room in our clients’ homes. We have the most extensive product line and offer the widest range of accessories. We work individually with each client and design personalized solutions that are truly build around client's organizational needs and aesthetic desires, while staying well within their budget. Your storage problem is unique. And no closet company is better fit to help you organize your life than Closet Factory. Where every closet system is custom. Made to order. Your order. It’s the reason we’ve become the authority in customized storage solutions. Our Closet Factory closet systems are not your typical closet organizers. They are designed just for you, your space, your wardrobe, your needs, and your budget. We listen carefully when you tell us what you want. And only then do we create a closet design. One that will fit your needs and space perfectly. We learned how to create closets that fit what people wanted. We became the leader in custom closets. Today, we continue to set new standards in client care, custom closets, closet design, and craftsmanship. Let Tailored Living design unique storage solutions in your home and garage spaces personalized to fit your home and lifestyle. Our in-home and garage products have become the go-to choice for industry experts and can be seen on many popular networks including HGTV's "Property Brother", NBC's "George to the Rescue" and "Rev Run's Renovation" on DIY. Call or E-mail now for your Free in-home consultation. We look forward to meeting you! An innovator of custom closets and personalized organization since 1984, California Closets Connecticut is an area leader in home storage solutions. 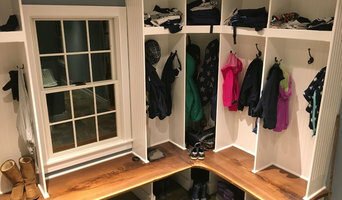 For more than 30 years, the team at California Closets Connecticut has designed custom storage solutions in Fairfield, New Haven, Middlesex, and New London counties for historical homes with unique, small spaces, as well as added organization to new, modern homes and condos to ensure every inch of space is utilized. Whatever your needs may be, the team will work closely with you to create a solution that’s perfectly tailored to your needs. Every system this team designs is custom created, locally produced, and installed by an internal team of expert installers. Most systems can be installed in your home or business in less than one day, causing as minimal disruption to your life and work as possible. The experience, dedication to service, and unmatched product quality makes California Closets Connecticut a true leader in closet and storage solutions for Connecticut. Visit the Norwalk showroom to get a firsthand look at the systems, unique finishes, and accessories offered. When you are ready to explore custom ideas for your space, schedule an in-home consultation. If your looking for high quality and personal service, you've come to the right place. At New England Custom Closets, LLC we'll give you the attention and personal service you'll come to expect and enjoy. New England Custom Closets, LLC is family owned & operated. My intrigue for walk-in closets began years ago. With a background in retail, I have accumulated an over abundance of clothing, shoes, boots & accessories! Growing up with a single mom and two older siblings; money was tight. I learned to coordinate my clothing by color, by style and to never take anything for granted. Over the years I still have a hard time getting rid of items I have found comfort in for so many years, but my obsession to donate then replace my clothing continued to grow & my love in designing walk-in closets began... As relatives began having empty nest syndromes, they realized I could turn that empty bedroom into a beautiful Custom Closet. Over the past few years I have turned my passion into a career and thus my love for New England Custom Closets began... We welcome your comments, your ideas and of course testimonials! And I personally look forward to helping you create that Perfect Custom Closet for your home! Sincerely, Kim G.
Life can get hectic, find harmony, get organized, and focus on what’s really important in life. Are You Organized can help. We specialize in custom closets and storage solutions for all areas of your home. We create beautiful and functional solutions to organize all of your closets, pantry, garage, home office, laundry room, entertainment center, mudroom. We also offer wall beds, outdoor kitchen cabinetry and wine cellars. Our closet and home storage systems are designed by us with you to fit exactly into your space. Each solution is customized to maximize every nook and cranny of your home. Are You Organized will design and professionally install a unique organization storage system just for you in your style preferences. With hassle-free installation, and helpful design from Are You Organized, you’ll be organized in no time. We offer many possibilities to create your unique organized space…with cabinet storage, shelving, and drawers for the office, entertainment center, garage, and kitchenette in a wide range of finishes and styles to compliment your home décor. To complete it all we offer functional and fabulous accessories. Customize your closet or home storage system with belt and tie racks, wardrobe valets, corner shelves, filing cabinets, and baskets – just some of the many options available. Can imagine the spaces in your home, beautifully organized and free from the distractions of too much clutter? Liberty Closet & Garage is here to help you design, manufacture and install your dream. From attic to garage to basement and everywhere in between, we give you the Freedom to Organize your life. Our design professionals will work with you to create innovative and cost-effective solutions for all your storage needs, customizing and upgrading your closets, pantry, home office, mudroom, laundry and linen, and garage cabinets and floors. We provide your family with custom-designed closet and garage systems that are the solutions to fit your needs and wants. Our designers bring their years of experience to every project—large or small—and will listen to you and work for you in all aspects of a project. Our designers works with our expert installation team to ensure the finest details of your design needs are met. All solutions are designed, custom-built or assembled, and expertly installed by experienced, polite, neat craftsmen in a timely fashion. We are located on Rte 7 just north of the Danbury / Ridgefield town line so come visit our showroom, where your storage solutions are waiting! I help bring people peace into their home and productivity into their business by creating organizational systems that will match their work style, productivity style and their ease of use. I also help people preserve their memories and create legacies to pass down to their families. Affordable Closets, Inc. specializes in closet systems; standard closets, walk-in closets, pantries, linen closets, roll-out shelving, laundry room organization, in-home offices, and garage organization. Before hiring a professional organizer, consider exactly what you need. Have you just moved into a Windsor, CT home and have no idea where to put everything? You may want to consider an organizer who specializes in room-by-room space planning or estate organization. Perhaps you’re faced with a tiny closet and an overflowing wardrobe. In that case find a professional who focuses on closets to help you get back on track. Also consider the types of objects that need organization. Are they items like books, family photos, files or collections? You’ll want a professional organizer who has experience designing custom systems with Windsor, CT companies that will best fit your needs. Find a professional closet and home organizer on Houzz. Narrow your search in the Professionals section on Houzz to Windsor, CT closets and home organization.